Alexander Wurz, signed 8x6 inch photo. Allan McNish, signed 6x4 inch photo. Andy Priaulx, signed 12x8 inch photo. Antonio Pizzonia, signed 9x6 inch photo. Baron Emmanuel "Toulo" de Graffenried, signed 6x4 inch photo. Bobby Rahal, signed 7x5 inch photo. Christian Danner, signed 6.5x4.5 inch photo. Christian Klien, signed 6x4 inch promo card. 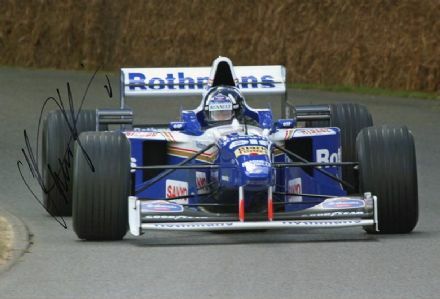 Damon Hill, Formula One, signed 12x8 inch photo. Dario Franchitti, signed 12x8 inch photo. 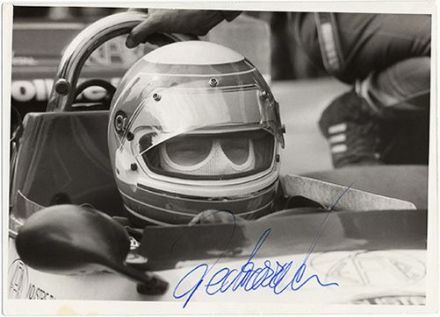 David Brabham, signed 6x4 inch photo. David Brabham, signed 7x5 inch photo. David Coulthard, signed 10x8 inch photo. David Coulthard, signed 7x5 inch photo. 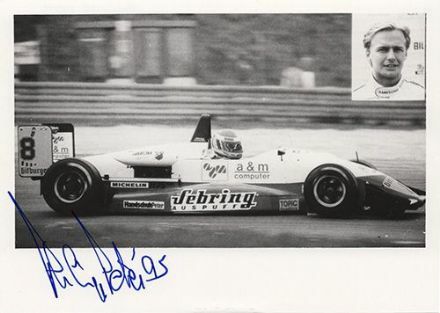 Derek Bell, signed 6x4 inch photo. Eddie Cheever, signed 6x4 inch photo. Emanuele Pirro, signed 6x5 inch photo. Emmanuel Collard, signed 8x6 inch photo. Fred Wacker, signed 6x4 inch photo. Geoff Lees, signed 6x4 inch photo. Giancarlo Fisichela, signed 7x5 inch photo. Gregor Foitek, signed 6x4 inch photo. Hans Herrmann, signed 7x5 inch photo. Hans Heyer, signed 6x4 inch photo. Hans Joachim Stuck, signed 6x4 inch photo. Heinz-Harald Frentzen, signed 6x4 inch photo. Hubert Hahne, signed 6x4 inch promo card. Jarno Trulli, signed 12x8 inch photo. Jarno Trulli, signed 5.5x4.0 inch photo. Jarno Trulli, signed 6x4 inch photo. Jarno Trulli, signed 7x5 inch photo. Jean Alesi, signed 7x5 inch photo. Jean-Pierre Beltoise, signed 5.5x4.0 inch photo. Karl-Gunther Bechem, signed 6x4 inch photo. Marc Gene, signed 6x4 inch promo card. Mark Blundell, signed 7.5x5.0 inch photo. Mark Blundell, signed 7x5 inch photo. Narain Karthikeyan, signed 7x5 inch photo. Nick Heidfeld, signed 10x7 inch photo. Nick Heidfeld, signed 6x4 inch promo card. Nick Heidfeld, signed 7x5 inch photo. Olivier Panis, signed 6x4 inch photo. Olivier Panis, signed 7x5 inch photo. Patrick Tambay, signed 7x5 inch photo. Paul Frère, signed 6x4 inch photo. Pedro de la Rosa, signed 12x8 inch photo. Pedro Diniz, signed 6.5x4.0 inch promo card. Philipp Peter, signed 6x4 inch photo. Piercarlo Ghinzani, signed 6x4 inch photo. Piercarlo Ghinzani, signed 7x5 inch photo. Ralf Schumacher, signed 12x8 inch photo. Ralf Schumacher, signed 9x6 inch colour photo. Riccardo Patrese, signed 6x4 inch photo. Robert Manzon, signed 6x4 inch photo. 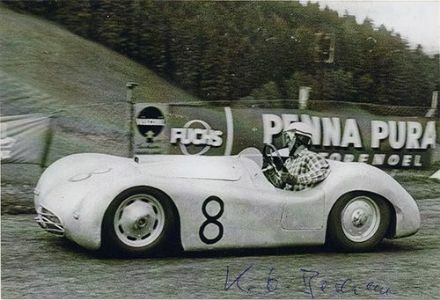 Rupert Keegan, signed 7x5 inch photo. 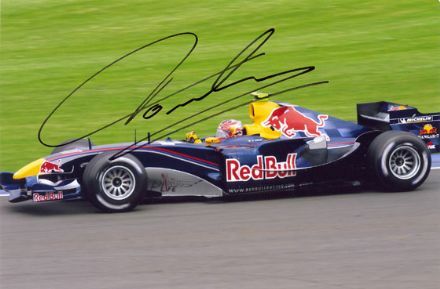 Sebastien Buemi, signed 7x5 inch photo. Shinji Nakano, signed 10x8 inch promo card. Sir Stirling Moss, signed 6x4 inch photo. Stephane Sarrazin, signed 7x5 inch photo. Thierry Boutsen, signed 6x4 inch photo. Thierry Boutsen, signed 6x4 inch promo card. Tiago Monteiro, signed 9x6 inch photo. Timo Glock, signed 5.5x3.5 inch promo card. Timo Glock, signed 6x4 inch photo. Vitantonio Liuzzi, signed 9x6 inch photo. Walter Pedrazza, signed 7x5 inch photo. Yannick Dalmas, signed 6x4 inch photo.